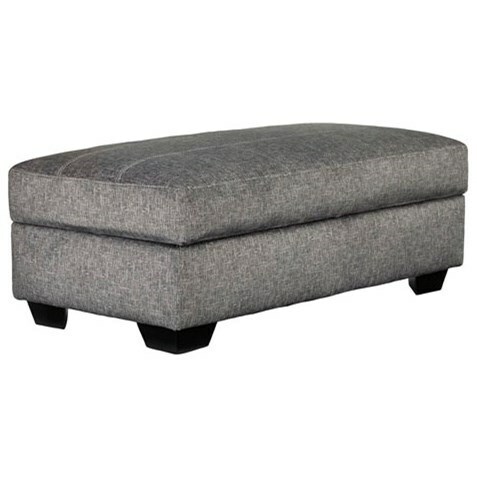 Gray fabric with a crosshatch design adds appeal to this functional cocktail ottoman with storage. The top of the ottoman features accent stitching and lifts off to allow access to the interior storage. The Belcastel Rectangular Ottoman With Storage by Benchcraft at Value City Furniture in the New Jersey, NJ, Staten Island, Hoboken area. Product availability may vary. Contact us for the most current availability on this product. 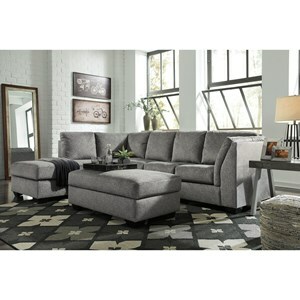 Create a living room you will love to come home to with your choice of pieces available from this collection. 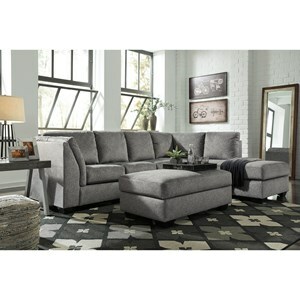 The gray crosshatch fabric provides a fashionable design element to the overall look. The Belcastel collection is a great option if you are looking for furniture in the New Jersey, NJ, Staten Island, Hoboken area. Browse other items in the Belcastel collection from Value City Furniture in the New Jersey, NJ, Staten Island, Hoboken area.